Anyone who played in Captain Beefheart's Magic Band is of course an automatic A-lister in the avant/strange music world. 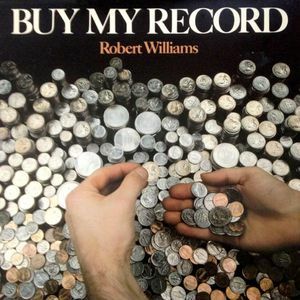 So it's no wonder that late-period Magic Band member Robert Williams' debut solo release, a four-song EP from 1981, is chock-a-block with strange music superstars: a couple of DEVOs, a slew of Zappa/Beefheart sidemen, even Robbie Krieger of the Doors. And the music is quite nice, too, moving into (slightly) more commercial New Wave territory with its' integrity intact. 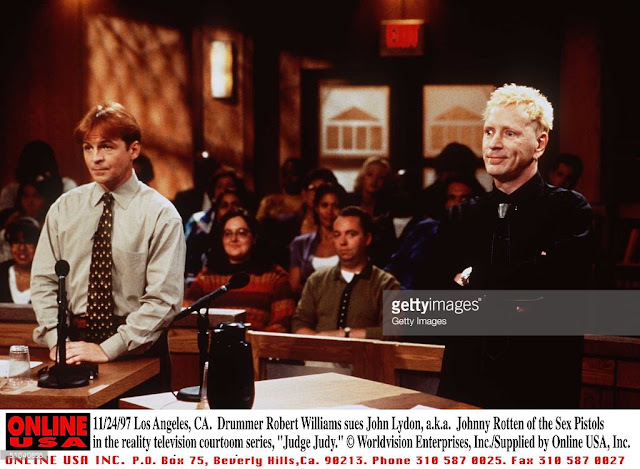 But unfortunately for Williams, his 1997 public humiliation on the hugely popular (and still running) "Judge Judy" show is what he will always be best known for, at least until reissues of "Doc At The Radar Station" knock Bruno Mars off the charts. Williams toured with PiL, and attempted to sue no less than Johnny "Lydon" Rotten himself. To put it in strictly legal terms, he did not win.The complete episode is no longer available on-line, and the short clips that are up don't do it justice, so you'll just have to trust me when I say that it was one of the most howlingly funny moments in TV history. Poor li'l fella. He does deserve to remembered for his music, not just with the Cap'n, but on his solo records, and with Eazy Teeth, who made one great experimental synth-punk single in 1980 that featuredTito Larriva from the Plugz on vocals, included here. Also: 2 tracks from his fine 1998 album that is in print, "Date With The Devils Daughter": "Hello Robert," which features some hysterical (in all senses of the word) answering machine messages from Wild Man Fischer, and "Frank and Don and Me", feat. guitarist Jeff Morris Tepper from his Magic Band days. Not bad for a "nudnik." I've seen that Judge Judy clip numerous times over the years but I have never connected Robert Williams with the Beefheart Robert Williams! I remember watching that and thinking "that's it for that drummer's career". Now I wanna see it again! Wish I still had my VHS copy of the show. SOMEONE must have one. Never saw the original, so no idea how much has been stripped out of here, but.. Thanks anon, yep that was just a short clip, not the whole segment, but it def gives a sense of what a hopeless case Williams had. When the judge is calling you Yiddish insult words, you don't stand a chance. And that clip does contain Johnny's priceless closing comment "fairly obvious conclusion!" that my wife and I have been quoting for years. ok...wow. I;d say this was fairly awesomely awesome. A Beefheart crony should be a blessing. Like Snakefinger for example. Wow, I didn't know that Robert Williams or Tito Larriva were in Eazy Teeth! They also had three tracks on the Red Spot compilation LP (Subterranean Records, 1981). OUTER SPACE MUSIC FROM OUTER SPACE!